It’s not the first time I’ve been here. I lost 10 stone in 2010 and went on to climb mountains; right up to Elbrus in Russia, Kilimanjaro in Africa (two of the 7 Summits), and above Everest Basecamp to a technical climb on Island Peak in Nepal, at 3,005 feet. I learned all about portion size, control, training, exercise, I worked out in the gym five times a week and could deadlift 100kg. I wore the T-shirt and I even wrote the book about it! *Teena Gates One Foot in Front of The Other (Gill&MacMillan). Which is why it feels so inexplicable to be back at the foot of the mountain, and why I feel such a fraud to be writing again about weight loss. There are plenty of reasons but no excuses, and I know I’m being hard on myself, but it’s better than being in denial. I seem to have dug a very deep hole over the past number of years, where I occasionally gather the energy to peak above the rim and check out the rest of the busy world before sinking back under the weight of my responsibilities. I also realise that whatever was broken with my relationship with food, wasn’t fixed. I wasn’t fixed. One thing I am clear about is that this is my last chance. I am 53 years of age and I can’t afford to run away and lose myself in food again. I am effectively the sole carer for my 93 year old, amazing, funny, strong and gentle dad and his sidekick GoogleDog. Google’s one of the best things that happened to us in the past year. Last Christmas 12 months ago, I went to the DSPCA to foster a Jack Russell to keep dad company and came home with a German Shepherd with sad eyes, who instantly became the love of our lives. We all live together in West Dublin and I know how precious every minute we have together is. That time is so precious that apart from work, I stopped going out of the house, I even had our shopping delivered. Somehow, somewhere along the line I forgot that ageing is not a disease, and began the impossible and soul-destroying task of preventing dad from growng any older. He didn’t like being left alone, and I got to the stage when I cried leaving the house and cried coming home, afraid to open the door in case of what I might find. He then had a number of falls where he cut himself and needed hospital treatment and I think I became traumatised. Enter the comfort eater, and all the lessons I’d learned about being healthy disappeared into the mist. 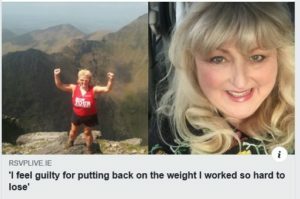 They say you often hit rock bottom before you start to recover, and buried deep down in Pandora’s box this Christmas was an Angel of hope; an intervention from a friend, and an invitation to Slimming World. It’s not as if other people hadn’t offered help. In fact, I’ve been extremely lucky with friends and family refusing to give up on me. But I can only see that now because the mist is finally clearing. No amount of care, assistance, nudging, kicking, or coercing will make you lose weight. It has to be your own decision, and the time has to be right. It’s just as if a switch clicks on in your head and you’re suddenly blessed with clarity and determination. I went to my first weight loss meeting on January 9th and since then, in two months, I’ve lost just under 2.5 stone. It’s not just about losing weight. It’s about being honest enough with myself to admit I need help with dad. I’ve hired nursing aids to be with him when I go out, and to stay with him when I go on a break. Admitting that I need that, has taken more than a year. It feels like I’m being disloyal to my dad to admit that it can be tough to be a Carer. I’m afraid that admitting that suggests I don’t love him enough and that couldn’t be further from the truth. I’m learning to understand that building a support structure and fighting for the supports that dad deserves, is not just making my life easier but is also benefitting him. In fact, it’s all about dad. Because if I don’t start looking after myself, I’m going to become too ill to mind him, and then we’ll really be in trouble. There was a time when dad fell or got stuck in the bath, I could lift him; but I can’t do that anymore because my back is too weak. There was a time when I was strong enough to hold dad in the sea during the summer when he wanted to go in the water, but I can’t do that anymore. Last year I pulled a walker down the steps at Dublin’s Portmarnock strand and dragged it down to the sea, so that he could sit in the waves, because I couldn’t hold him and support him in the water on my own anymore; because of my weight and my sore back. I want my strength back, for dad and for me, and for GoogleDog. I want to run across the mountains with her, instead of hobbling from seat to seat when I bring her for walks in our local park. For all of those reasons I’m pushing really hard to get mobile again. My back is still very sore, but I can now manage to walk one kilometre without the muscles in my lower lumber going into spasm. I’ve made it round one loop, of a three-loop course in my local 5k parkrun and that’s given me a circuit. Something to build on. From running 10k races to shuffling along one kilometre may seem so tiny. But for me it’s a mountain, it’s my mountain, and I’m climbing it and getting stronger. I’m not fixed. I have such a long way to go. But I’ve got aims, and goals and targets and I’m back competing with myself, setting myself challenges and building on my achievements. I want to complete my 5k parkrun, I want to swim a mile, I want to get back on my bike, I want to fit back into my kayak, and most of all I want to be back in my beautiful mountains by the Summer. I want to do these things for me, but I realise that everyone around me will benefit too. I’m loving the weight losses that I’m clocking up now, and I’m so grateful to everyone who’s encouraging me. I need to lose over 150 more pounds to be close to my target and the support I’m receiving on social media is really motivating. But I feel guilty for being back here; as if I snubbed my nose at the help that I got the first time round and wasted it. I am truly sorry. I feel I let people down, including myself. I have read headlines about yo-yo dieters and the hell of being trapped in a cycle of gaining and losing weight, and I really am determined that this is the last time I climb this particular mountain. I realise it’s not just about what I eat. In the words of one of the girls in my Slimming World Group this week…. “I’m not just working on myself from the neck down, I’m working on myself from the neck up”. I want this to be my final lifestyle change.